Metal paints are specially formulated for painting metal surfaces. There is a wide choice of metal paints in the market that come in various colors and containers. These are also available as liquid paint meant for spray paint to make the work easier, by simply spraying on. The choices are many, so lets check whats best for you. Metal paints generally come in two categories, latex-based paint or oil based paint. Latex paint is one of the earliest of paints and continues to find favour for many paint jobs because it dissolves in water and does not need spirit or turpentine, making it cheaper as well as has fewer chemicals. Manufacturers enhance its staying and drying properties by adding acrylics, vinyl, or rubber-based compounds. Latex paint can also be cleaned easily, if marked and when completely set. It is non-flammable, can be retouched easily, and can be applied on almost any surface, even without a primer for some jobs. It comes as glossy, flat or stain finish. There are some downsides to Latex paint, one being it is not as durable as oil paint, and if applied directly, it can cause rusting of the metal surface. It also doesn’t clean as well as oil-based paint nor adheres as well to glossy metal as oil paint. Oil-based paints are clearly a more favoured choice for painting upon metal surfaces. This kind of paint is durable and will resist stains, chips, and marks. It takes longer to dry but will cover most surface imperfections and is also easy-to-clean. Some oil paint brands have special formulations that do away with the need to use a primer. 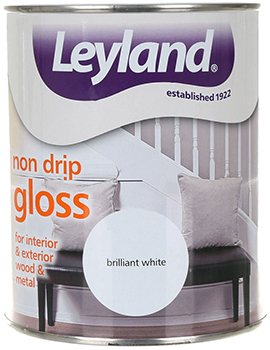 Oil-based paints come in high gloss and flat finishes. However, on the downside, oil-based paint also fades much faster than latex-based paint. This would mean greater and frequent touch-ups and expense. Also, it already comes with a higher price tag compared to latex paint because of its composition. Oil paints are more labor intensive and not as easy-to-use as latex-based alternatives. These are flammable and also give out with strong fumes when they are being applied.